A classic status update from my great aunt. 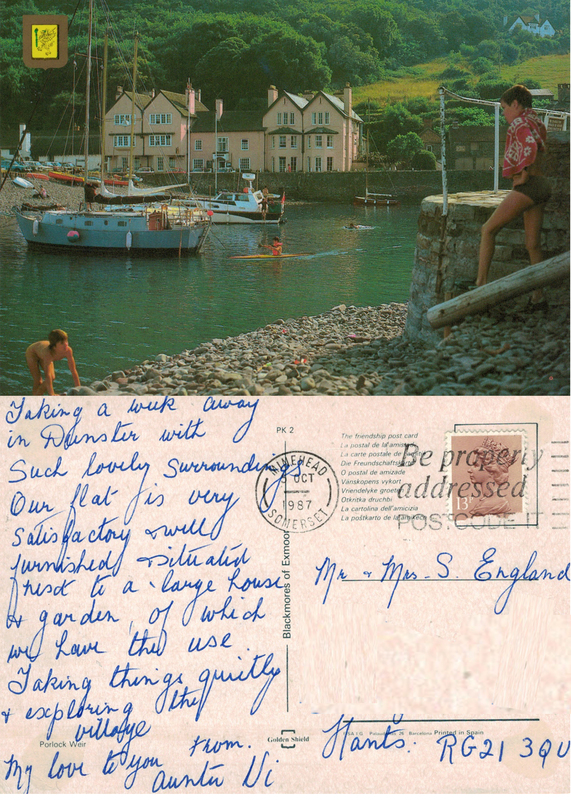 The postmark date is Minehead 5 Oct 1987. 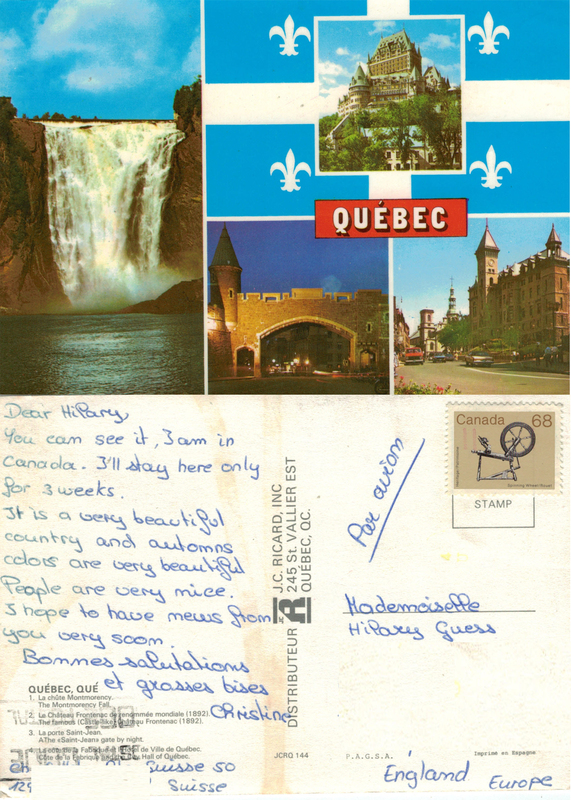 The 13p stamp was the cost of sending a postcard second class in 1987 (this is approximately 34p in 2015). We were still being reminded to ‘Be properly addressed’ and to ‘POSTCODE IT’ – this is some thirteen years after it became mandatory; by this time most people in the UK seemed to have got the idea! Porlock Weir is still a popular spot for visitors, it is about 10 miles from Dunster. The yellow dragon in the top left hand corner of the picture is the logo of Somerset County Council. The eagle eyed amongst you will notice the name change – I’d got married. Auntie Vi was married to Uncle Wilf who was Grandad‘s brother. They did not have children, hence no grandchildren; they were great fun and I thoroughly enjoyed spending time with them when I was a young child. We were out one day, us in our car, with Wilf and Vi following behind; there was a crash, Wilf died. With a child’s eye view, the horror was lost on me – he was my Grandad’s brother, therefore ‘old’. I saw Auntie Vi more regularly, she holidayed with us and livened up our birthday parties, but she lived as a widow (seeing me grow up, get married, have my own children) for at least another 20 years. How sad that she was denied spending that time with Wilf. Another card from Anne featuring my nickname from school which endured for several years. 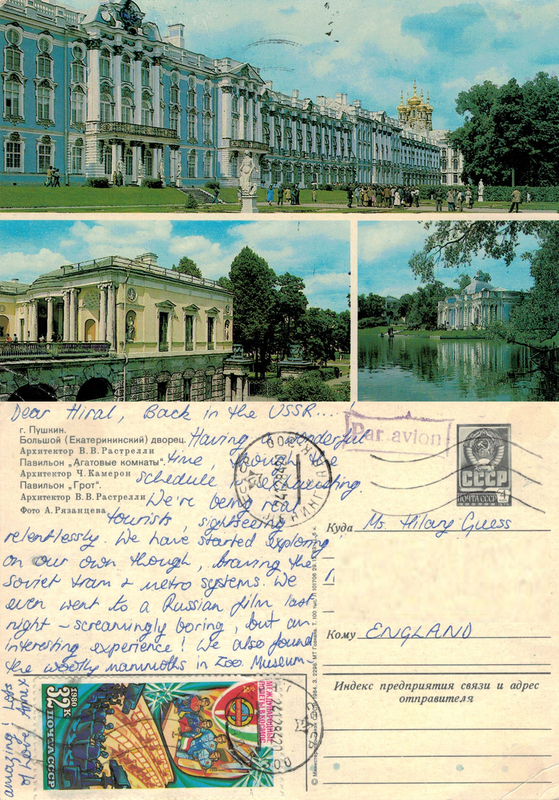 ‘Back in the USSR’ refers to an organised college trip we took there in 1980 – it is also a world famous song by The Beatles. The buildings featured are beautiful, I think the top one is the Hermitage – can anyone else identify them? Or translate the descriptions? My Russian is quite limited. I’m pleased to report that as a result of this blog Anne, Sara and I all met up recently in London. We spent time enjoying Tate Modern, had a meal, some drinks and a great wander down memory lane. Many great (and small) things are forgotten and lost without a trace – they can only be resurrected by reminiscing with those who shared the same experience. 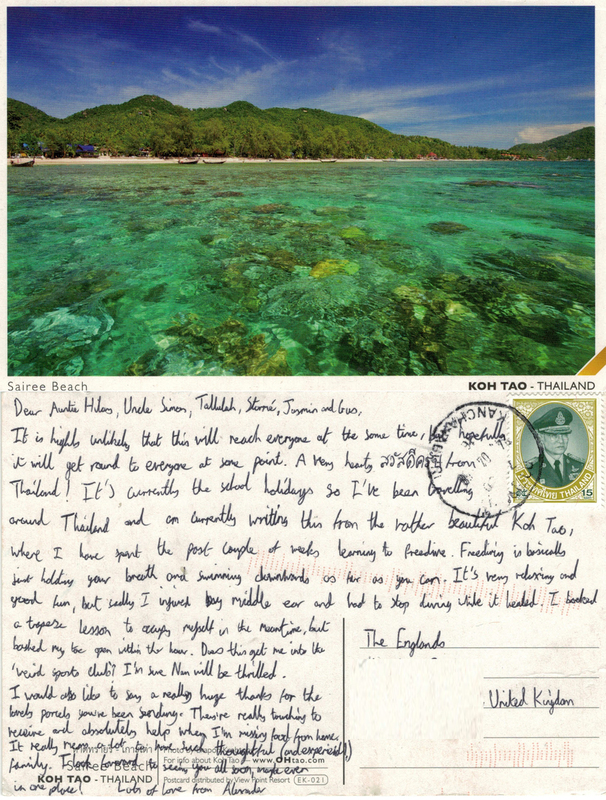 Postmarked 24 04 15 Kanchanaburi this is a fabulously detailed status update from Koh Tao. Alexander is my nephew – on his gap year, teaching in Thailand for a year. His older cousins (my children) have all travelled and worked abroad. A year is a long time to be away from family, friends and familiar treats, so I make sure I send regular parcels filled with Cadbury’s dairy milk, Cadbury’s mini rolls and Fox’s party rings. I was very pleased to receive this card a couple of weeks ago – we are not FB friends – the descriptive and detailed status update confirms that he is making the most of his time and enjoying new experiences. Alexander is academic and articulate with a gift for languages and I am a proud Auntie.